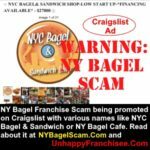 The post NYC Bagel and Sandwich Shop Scam Warning appeared first on NY Bagel Scam. The post NYC Bagel & Sandwich Shop: New Name, Same Scam appeared first on Unhappy Franchisee. The post NY BAGEL SCAM Washington Enforcement Order appeared first on Unhappy Franchisee. The post NYC Bagel, NY Bagel, Joe Smith, Dennis Mason Legal & Financial History appeared first on NY Bagel Scam. The post Alexandria VA NY Bagel Café is Latest Closure Victim appeared first on NY Bagel Scam. The post DAVIDOVICH BAKERY, Marc Fintz & The NY Bagel Scam: Time for a Boycott? appeared first on NY Bagel Scam. The post Geof Kine, West Coast Business Equipment Supplier to NY Bagel Scam appeared first on NY Bagel Scam. The post Is Benedetto Ben Catarinicchia of ZACS International a NY Bagel Scam Profiteer? appeared first on NY Bagel Scam. The post Beware of Ben Catarinicchia, ZACs International appeared first on NY Bagel Scam.